Leveraging on our team and infrastructure setup, we offering flawless Copper Wire Braided Strip. Fabricated by making use of supreme quality parameters of the industry, these offered products meet divergent demands of the clients. In addition to this, strips that we offer fined application in fabricating, joining and forming electrical transmission and distribution alliance. 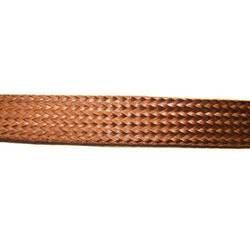 Resistance Welded Flexible Braided are available from the customized size cross-section area. Higher cross-section area can be made on request. We can supply copper flexible welded with non-ferrous components. We are offering our clients with the finest Bare Braided Flexible Strip. Manufactured by making use of supreme quality basic material, these offered strips satisfy defined parameters of the industry. Furthermore, to meet multifarious requirements of the clients, we have made the offered strips available in different sizes and specifications.